Last year I had this to say about 2012. Well, needless to say 2013 blew 2012 out of the water. This was the biggest thing that happened this year so I might as well mention it first. On May 28th, 2013 (a day after my birthday) I got in my car and started driving. I would drive for the next 4 days nonstop through 10 states and all four time zones. Until that day I had lived in North Carolina for my entire life. I arrived in Portland on Friday May 31st at about 7PM local time (by that point I had no clue what time it was anymore, my body still thought it was 10PM). There are two major “life changing” aspects of this move. The first is that somewhere (and I still don’t know where it came from) I found the guts to uproot everything and leave everything behind, for all intents and purposes jumping off a cliff and hoping someone at the bottom would catch me. The fact that a multitude of people, including Lisa’s family, friends and church community did catch me is astonishing and leads me into the second aspect. From June until November I was essentially “homeless”. Yes, I was not the traditional “sleeping on the streets” form of homeless, but I had no place to call my own and very few possessions. I cycled through a series of “foster” homes and couch surfed while I looked for jobs and looked for places to live on my own. If it weren’t for the people who opened their homes to me I wouldn’t be here. To know that everything you have at a certain moment in your life, food, warmth, roof, bed, access to a phone to call loved ones, is provided by someone out of only the goodness of their hearts is incredibly humbling. It is a debt I can never repay, and one that will never be called upon. No repayment was asked or is ever expected from these amazing people. Lisa’s church preaches to help the poor and those less fortunate. These people surely took that to heart and “practice what they preach”. 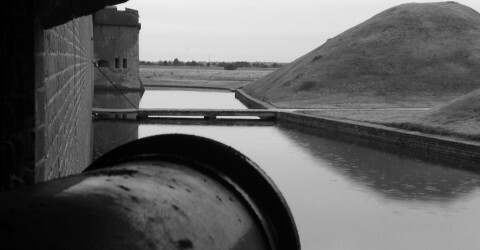 You can read about the Westward Journey HERE. After “The Year of the Race” in 2012 with 15 races in four different distances, 2013 was certainly a step back, but not in a bad way and certainly for good reasons. 2013 featured 7 races including 3 half marathons stretching from Florida to Oregon. 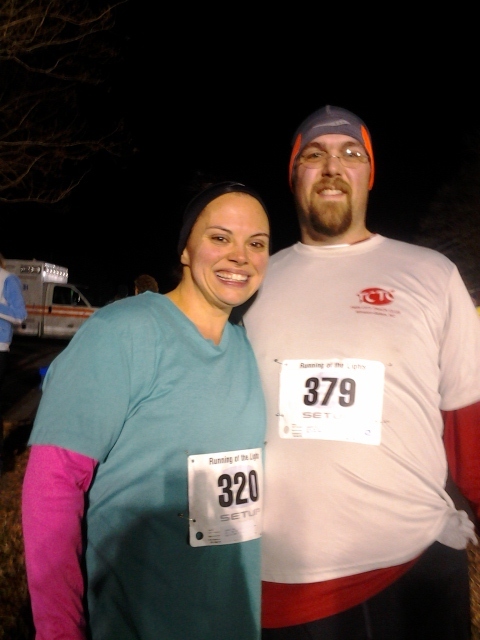 2013 started the same as 2012 with the Running of the Lights 5K at Tanglewood park. The run through the Christmas lights that started at midnight on New Years day was a repeat for me. However, this year Lisa had flown out from Portland to come visit me and happened to be here on race day and so she ran this one with me and this was our first race together. A few weeks later I would travel down to Orlando Florida to run in the Walt Disney World half marathon. This was a pretty amazing race but unfortunately was marred by a serious knee injury. I was able to finish the race, but had to walk from mile 9 to the finish in the surprisingly hot Florida sun. My parents and brother and sister were there to support me and cheer me on and also cheer me up after my disappointing finish. 3:36 was my worst finish ever, but I finished. I suppose I had plenty of points where I could have dropped out and told the race crew I quit, but I plodded along and made my way to the finish. In February, I would suffer my first DNS (Did Not Start). I had signed up for the Pilot Mountain Payback “Heavy” half marathon before I was injured at Disney and I decided I was going to try my best to still complete it. I had completed the 3 in 3 months I needed to qualify for the Half Fanatics, but now was going to try for 6 in 6 months. Due to my injury I was not able to run for several weeks and not able to put in any serious mileage at all. The “Heavy” was about 14 miles so longer than a half and would have been my longest run to date. I was still dead set on running it until the night before the race. I was literally in a panic. I wasn’t sure I could do the distance, it was snowing that night and conditions on the course were going to be horrible. After a long conversation with Lisa, who told me that if I was so upset about the race I should skip it, I decided not to go. A few days later, I found out how awful the course was, with creek crossing that were waist deep, and how many people skipped and how many people did not finish and I knew I had made the right choice. I wasn’t happy with it, but I was at peace with it. In March and April I ran a pair of 10Ks, a repeat of the St Leo’s 10K and then a new race, the Hope for Hospice 10K. The first one I merely wanted to finish, which I did in a respectable 1:13, while the second one was part of the training for my second half marathon and I finished a tough course in 1:11 which was only 3 minutes slower than my 10K PR from last year. In late April I ran my second half marathon of the year, the Kings Mountain Half in Kings Mountain SC. I was excited to run this race since it ran through a Revolutionary War battlefield, but that ended up being a huge disappointment since the “cannons and monuments” portion of the battlefield was nowhere near where we ran. An out and back on some access roads with nothing by trees to look at was a HUGE letdown. Also, towards the end of this race my calves cramped up really bad and I ended up walking from mile 11 to the end. My 3:08 finish was better than Disney, and slightly better than my first half in New Orleans, but nothing close to a PR. About the only saving grace was this was my first race in South Carolina, so it was a new state for me. At this point, the rest of my 2013 race calender got completely erased. The races I had planned for the Fall were not going to happen and the races for May and June I needed that money for my move across the country. It would be a while before I would race again, but me and Lisa started running together as often as we could once I got settled in Portland. In November we ran our second race together, a 10K, and my first race in Portland. The Cause and Event 10K was a fantastic event that supported many different causes. The course was mostly greenway through west Portland/Beaverton neighborhoods. Of course, being Portland in the fall, it rained on us during the race, but it was mostly just a slight drizzle. I got to meet some of the people who help run Camp Lutherwood and raise some money for them so that was all good! In December, we finally ran our first half together in Portland, the Foot Traffic Holiday half. A nice run through Northeast Portland, it was COLD and rainy, but a really nice course and well supported. Other than my bad cramps for the last two miles it was also a great run. Lisa rocked it! We finished in exactly 3 hours which was not a PR for either of us, but not our worst finish either. The next run for Lisa and I will be another midnight New Year’s Day race, but that’s for 2014! While we didn’t do as much running over the summer as we planned, we certainly took advantage of the gorgeous weather and Lisa introduced me to one of her favorite past times. Hiking! What else does one do in a place full of mountains and trees? I was quickly hooked. We started out with an “easy” hike that turned out to be quite a journey. The loop around the Trail of Ten Falls was about 7 miles or so of mostly flat terrain, but then at the end there was some steep switchback stairs and a steep uphill climb to the last falls which really took it out of me. I was completely exhausted by the time we finished but it was totally worth it. The scenery was unbelievable and you couldn’t believe you were just a short drive outside of the city. It felt like we were in the middle of nowhere. The next hike, merely a week later, was the shortest in distance, but by far the most challenging. We drove up to Timberline Lodge, which is about halfway up Mt Hood (roughly 6000 feet elevation) and hiked out to Zig Zag Canyon. It was only about 2 miles there and two miles back, but it including dropping down into several smaller canyons, as well as the terrain shifting as we skirted along the edge of the timberline. At times we were deep into an old growth forest bushwhacking through underbrush and giant ferns and then at other times we were sliding through a sandy/rocky type landscape with not a tree in sight. We lost several hundred feet of elevation on the way out to the canyon and while the way out was a nice “walk” the way back to the lodge was suddenly extremely uphill and turned into a “climb”. This however, was an incredibly rewarding hike. About two weeks after that we embarked on our third hike of the season which started out innocently enough but turned into quite an adventure. We had planned on hiking up to Wahkenna Falls and then taking the trail back down along Multnomah Falls. Unfortunately, through a combination of a poorly marked trailhead and a confusing printed map we ended up parking and starting at the wrong place. We got onto the Angel’s Rest trail and of course we were several miles into it before we realized it but we continued on to the top of Angel’s Rest. We climbed about 1400 feet along the way and were rewarded with an amazing view up and down the Columbia River. Across from us was Washington State and we could almost see all the way back to Portland. At this point we continued along the trail which we thought would take us to Multnomah Falls. We crossed a creek and then lost the trail and were a few minutes away from becoming very lost. A couple and their dog emerged from the brush and warned us not to go that way since the trail was overgrown and faded. It turned out they had just come from where we wanted to go, so they showed us the way. We parted ways at the top of Wahkenna falls as they headed to Multnomah but without them we would have been seriously lost. We made our way down the side of Wahkenna falls which was absolutely breathtaking and made our way back down to road level. Now because of where we parked, we had about a 2 mile walk along the side of the road to get back to the car. This was terrifying since there was no shoulder and warnings to NOT do what we were doing, but we had no choice. What was supposed to be an easy 4 mile hike turned into a very challenging 9 mile hike, but we survived it and made it. Lisa loves to travel and we’ve done our fair share of it even if only in the local area. Shortly after I arrived in Portland, we headed out to the Oregon coast and took in Cannon Beach, Tillamook, Lincoln City, Depoe Bay and Newport. The Oregon Coast is not like anything I have ever seen before. Rocks and cliffs and lava flows and trees right up to the water line. It resembles close to what I expect the Northeast looks like up around Maine. Also, a month ago we went to Seattle which was a really cool trip and a place I’ve wanted to go for a long while. We will certainly be headed back there soon I’m sure. Changing jobs is never fun, but moving all the way across the country meant quitting my job and then trying to find a new one. After 3 months that felt like FOREVER I landed a job in Vancouver at a company that makes vitamins and herbal supplements, so I got back into the Food Science industry to a certain degree. I’m doing quality work but also a decent amount of paperwork and regulatory responsibilities. They weren’t kidding that the job title “Lab Administrator” is a “little bit of everything”. This part hasn’t gone so well this year, but I’m not too terribly upset about it. I started the year at my lowest weight ever at around 235, but my Disney injury sidelined me for a long while and I ended up putting a little weight back on, probably close to 245. Then after I moved I’ll admit that I put on several more pounds as I ate my way around Portland (no regrets AT ALL). I’ll be finishing this year in the 260’s so I’ve actually gained weight, but I’m still way under where I was in 2011 and most of 2012, so I’ll take that and jump into 2014 with both feet. Can 2014 build on an incredible 2012 and then an epic 2013? Stay Tuned!!!!!! The New Year means different things to different people. For most it’s a fresh start or starting over. Not so much for me, since I continued my fitness and healthy eating for most of 2012, slipping up a little in December a lot of which was injury caused. 2012 was such an amazing year I’m not sure how I’m going to prevent 2013 from being a letdown. How do you follow up that act? After injuries and holidays I do feel a little sluggish and have to start looking for motivation. I started 2013 the same as I did 2012, with the Running of the Lights at Tanglewood which started at Midnight. Since my girlfriend Lisa was visiting me this week she ran the race with me which of course made it special. I didn’t wear my Garmin and I don’t have a clue what our finishing time was. It wasn’t as cold pre-race as it was last year which was nice, and it seemed to go by faster this year, possibly from knowing the course and when we got to a certain part knowing we were almost done. Lisa really loved running through the Christmas lights, so that was awesome and I’m glad we had a chance to do it together. Coming up this next weekend, I’ll be heading to Walt Disney World to run the WDW Half Marathon on Jan 12th. This will be a mini-vacation with my parents, sister, brother and his fiance all coming to spectate and visit the parks. This will be another “fun run” that I’m not concerned about time at all, just a long one. There will be chances to stop for pictures along the course and have fun with the characters. I’m very much looking forward to this and this will also complete my 3 half marathons in less than 90 days to qualify me for the Half Fanatics. The following week (Sun Jan 20) Lisa will be running the Tinkerbell half marathon in Anaheim which will be her first Half, and I really wish I could be there for it, but I’ll just have to cheer as loud as I can from the east coast. I haven’t got a lot more planned for after January, my 2013 race schedule is still in flux for right now. I know I’m running the Tar Heel 10-miler and Kings Mountain Half Marathon in April. I don’t have anything planned for February or March at the moment. Some possibilities include the Winter Flight 8K or Pilot Mountain Payback Half in February, the JP Runner Girls FFF 5K will be sometime in March, so I know I’ll do that one, and then I have to decide between the St Leo’s 10K or the Tobacco Road Half Marathon (Same weekend in March). Nothing really planned after April either. I have a list of races heading out till about September, but have to make final decisions on which ones I want to do. I’m sure part of my current lack of motivation is not having anything to look forward to after Disney, so we’ll have to work on fixing that. I still have some weight to lose this year, and I’m to the point now where the weight starts to come off very very slowly, so it may take me the whole year to lose this final 30 pounds. Just keep plugging away at it. It’s a process. 2012 was the best year of my life. Lets hope it gets better from here!